After a family vacation and many hours on the airplane, I was happy to be home. That is, until I was quickly reminded of the racial landscape I was returning home to. “Don’t white lives matter?” asked the burly white homeland security officer. Frustrated by the ultimate welcome home to 2015 America, I quickly move toward customs, muttering, “Sadly, all too often, Black Lives don’t matter.” That was all I could muster. My failure to use my privilege to challenge the racist assumptions in his question, and his arrogance and entitlement was almost as frustrating as the question itself. For days, I would talk to my friends about how they would have responded. I confessed my guilt and disappointment. I talked to my kids about what happen. No amount of dialogue and processing changed my anger about his racist question and my failure as a transformative accomplice. I was infuriated by his abuse of power, callousness, sense of entitlement and lack of understanding about the persistent problem of American racism. For me, he represented a societal acceptance of daily report of stolen Black lives. His question was part of white America’s dodge and denial, even in the face of mounting evidence. It was an effort to even in the face of daily death, as well as persistent inequality, micro aggressions, and hyper segregation, to center white feelings and victimhood. I was equally frustrated by my own failures to offer him several seats, to school him into submission. I failed to use that moment to challenge his assumptions and misinformation about Black Lives Matter as organization and ethos. Despite wearing a shirt that announced, “Black Lives DO Matter,” I didn’t seize upon the opportunity to speak truth to power. I missed an opportunity to challenge his everyday racism. My support for protests from Ferguson to New York City did not spur me into action at the Seattle Airport. So today, I am here to respond to him, and those who daily make similar claims. If all lives matter, Cameron Sterling would surely be preparing for a weekend of fun with his Dad rather than planning for a life without a father. If all lives matter, black athletes who use their platforms to demand justice, to demand accountability, who contribute to a movement for racial justice would not be criticized and told to ‘shut up and play’ all while white football and basketball coaches who announce their support for certain political candidates are celebrated for their courage and commended for using their first amendment rights. BE clear, Becky’s husband, to be white in America is to be told over and over again, that our voices, desires, happiness, future and lives matter. 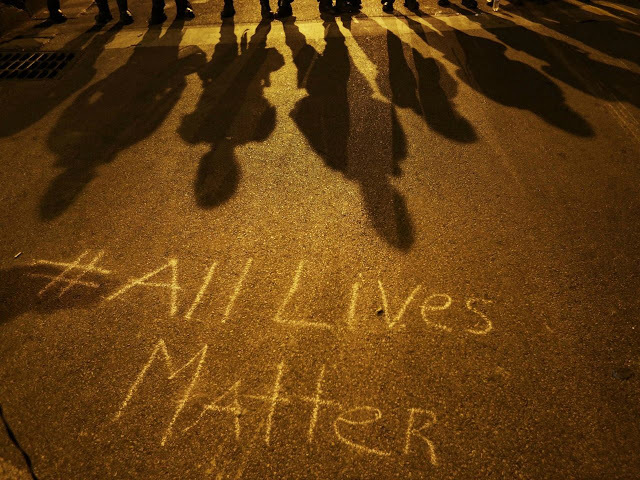 To claim “all lives matter” belies history, and these experiences. As Taylor notes, “After three hundred years, they can’t just randomly declare that the cake is now sugar free." If anything, white America continues to add sugar, calling rightful protestors over sensitive and delusional in their assessment. And you are angry about a shirt. While you claim not to see race, your act has whiteness written all over it. White supremacy makes it so whiteness is the ultimate pass. Whiteness is being the first one picked, the first one forgiven, and being innocent until proven innocent. Whiteness is the ability to reach for one’s ID. Whiteness is the ability to knock on a door in search for help. Whiteness is the ability to read a book without being questioned. Whiteness is never fitting a description, never being a profile. Whiteness is the ability to play with a toy in a park or a BB gun in a store. Whiteness is the ability to walk in a neighborhood and never be seen as an outsider. Whiteness is the ability to be angry and to express rage. While you claim all lives matter, you clearly don’t hear, see, or care about the experiences of African Americans, Latinos, Native Americans, and Muslims. Do you always ignore those you claim to care about? Instead of listening, you center your experiences, voice, and needs amid daily evidence of racial injustice; you claim to be the victim. If all lives matter, you would have shed a tear and changed your Facebook profile, or dumped a bucket of ice on your head for Ramarley Graham, Wendell Allen, Dante Price, Jamar Clark, Bo Morrison, and Kendrec McDade. If all lives matter, you would be fighting for justice for Trayvon, Lacquan , Alton Sterling, Freddie, Sandra, and Eric. What about Pedro Villanueva, Anthony Nunez, Christian Taylor, Dylan Noble, Rexdale Henry, Melissa Ventura, Paul Castaway, Zachary Hammond, and Jessie Hernandez? If you were committed to equality, justice, and a nation where racism did not stratified our lives you would be more outraged at yet another unjust killing, at the demonization of black bodies, at the efforts to blame Mike Brown, Sandra Bland, Alton Sterling and so many others for their own death. You are moved to anger by a hashtag, albeit one of tremendous power, one that challenges your worldview; you are outraged by a movement demanding justice and a culture of life rather than the continued loss of life. I know you need to go back to abusing your power, so let me ask you: why don’t you speak for and with the victims of American racism? Why not use that energy and outrage to demand JUSTICE? Why not commit yourself to helping build a society where black lives and black humanity are both recognized and protected? Whiteness … privilege … racism is a hard road to climb.